Wann Tower was a two story wood tower built before 1900 and housed a 40 lever mechanical frame, 12 of the levers controlled signals, 8 levers controlled switches, 6 levers controlled facing point locks, and 4 levers were used for train order signals. There was 1 lever that controlled a staff machine that was used to control traffic between Wann and Godfrey. The entire machine was mechanical with all the signals being of mechanical semaphores. On January 1st, 1940 the wood tower burned down and completely ruined the interlocking machine and plant. It was decided to rebuild the control center in the yard office and this became Wann Cabin. 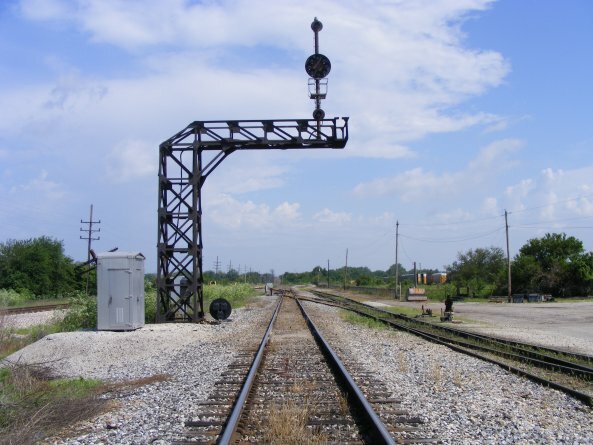 General Railway Signal Company designed and installed a electric interlocking with the understanding that the new system would not cost much more than replacing the old mechanical interlocking. GRS installed a small desktop panel with electric levers and model board. The wiring was suspended by concrete posts that were 9 feet tall and spaced 40 feet apart. The wire would drop down at selected points then ran underground to the signal or switch. The staff machine was also replaced and a basic block system installed. The plant remained in operation with the GRS electric machine until August 4th, 1996 when Union Pacific remoted it and closed the Cabin. The cabin was later demolished, all that remains onsite today is the foundation for the Cabin. In 2015 the Wann Cabin interlocking still has some of the last Color Position Light signals that remain in service, including some dwarf CPLS. 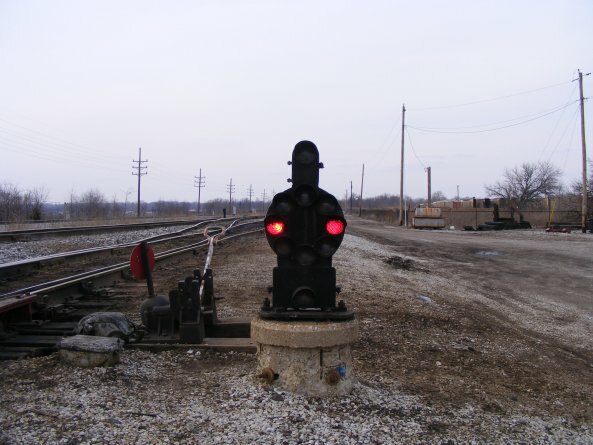 In 2007 a GRS FA that was located on the CCC&StL line was stolen and was repalced with a 2 light safetran dwarf. Also stolen at the same time was a two aspect GRS VA (dwarf CPL) that was on the old Alton Line, UPRR replaced both with safetran dwarfs. The CPLS still guard the South entrance to the plant and several still guard the north entrance into the plant including a dwarf. This photo was taken in July of 1976 and is looking North at the Cabin. 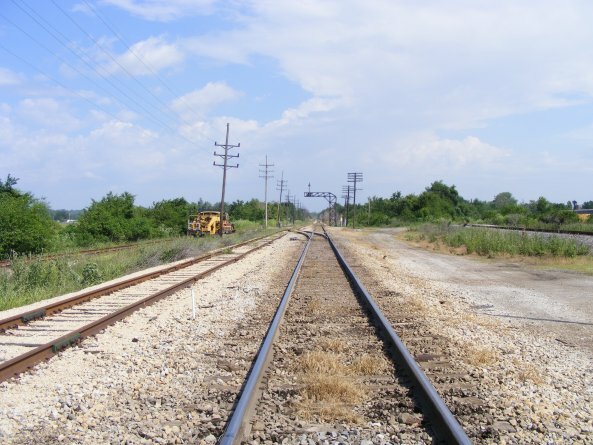 The ex-Chicago and Alton lines to the left and the ex-CC&StL Railroad to the right. 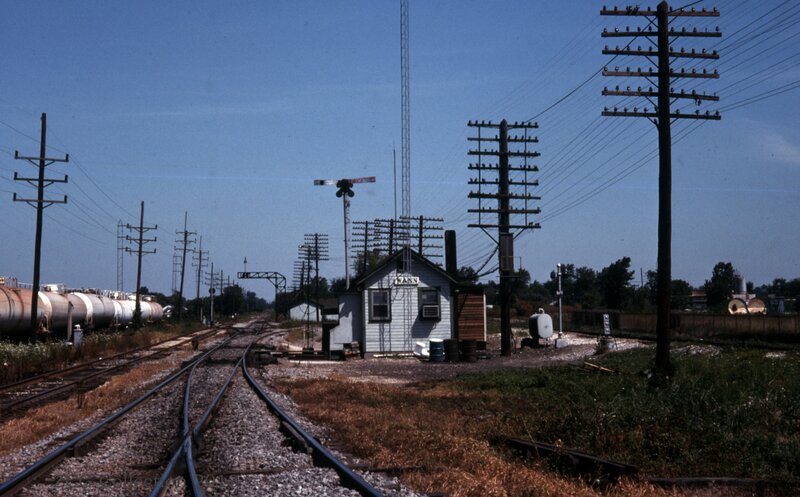 This photo was taken in July of 1976 and is looking North down the ex-Chicago and Alton lines. Switch 6, 8, and 10 crossover can be seen here. 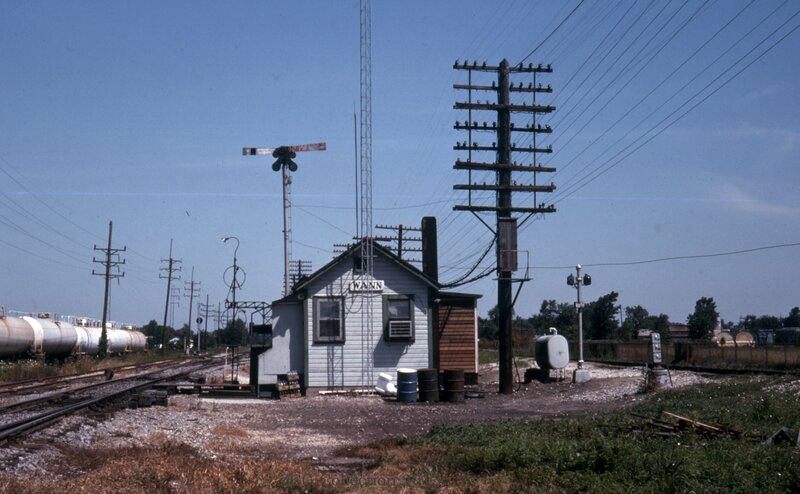 Signal 9R is the dwarf CPL and the signal bridge in the background is signal 7LA and the high mast CPL is signal 9L. 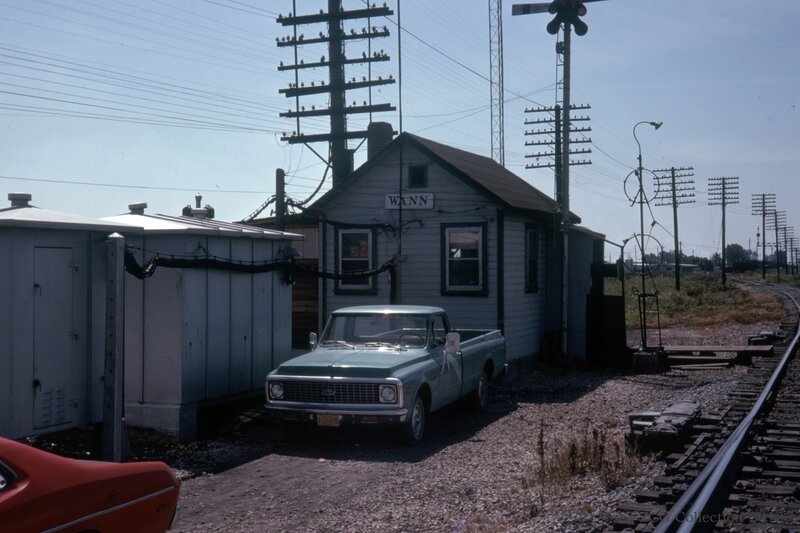 The dwarf color light on the right was signal 5L on the CCC&StL line. The electric train order signal was still there upto 2008 when it was removed by U.P.R.R. and restored in a private signal collection. This photo was taken in July of 1976 and is looking South at the Cabin. Switch number 8 can be seen in the lower right corner with switch number 6 in the background. 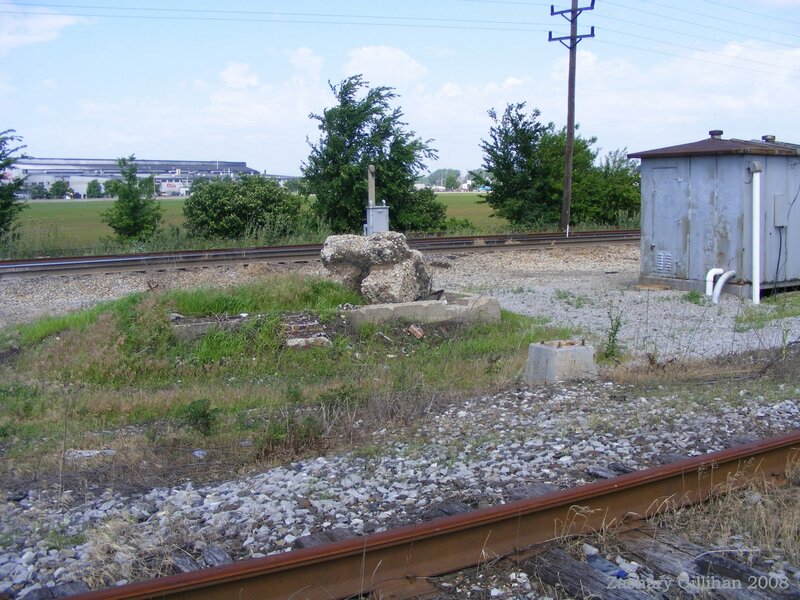 The steel relay cases are still there as of 2013 and that is where the original 2 story tower once stood. 2008, looking north down the old CCC&StL lines at Signal 3R, one of the 1940 signals still remains into late 2015 with no current signs of replacement. 2008, looking north down the old Alton lines at Signal 7R, this was once a high mast CPL that was replaced as a dwarf. The CCC&StL connection to the C&A is to the right. 2008, looking north down the old CCC&StL lines at Signal 5R and Signal 3R, both are of the 1940 signals still remains into late 2015 with no current signs of replacement. 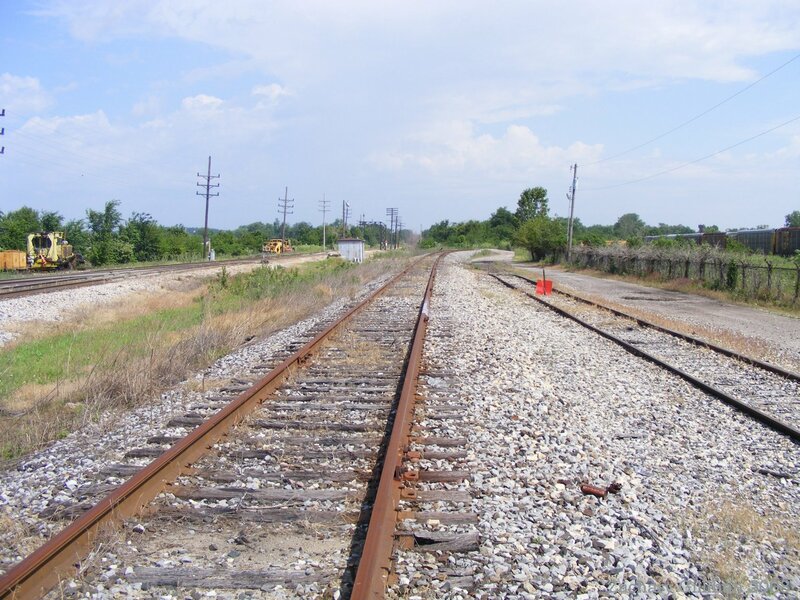 2008, looking north down the old CCC&StL line, Signal 5L should be to the left of the track but was stolen and was not yet replaced when I took this photo. The signal foundation can be seen further up the tracks as a round concrete foundation near the signal case. 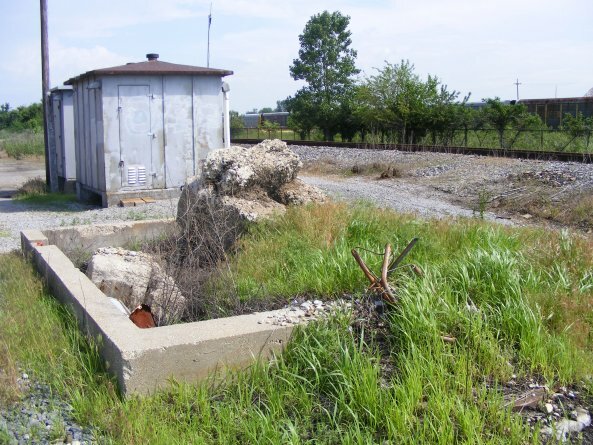 2008, Standing on the CCC&StL line, the foundation is where the old Adlake Train Order Signal was located for the CCC&StL Railroad. This signal was taken down by UPRR in 2006 and resides in a private collection today. The cabin foundation is all that remains of the old cabin, the signal case remains is from the 1940 signal installation. The white post in the background is where the old GRS VA (dwarf CPL) for the C&A railroad was located, it was stolen and was not yet replaced. 2008, all that remains of Wann Cabin is this concrete foundation. 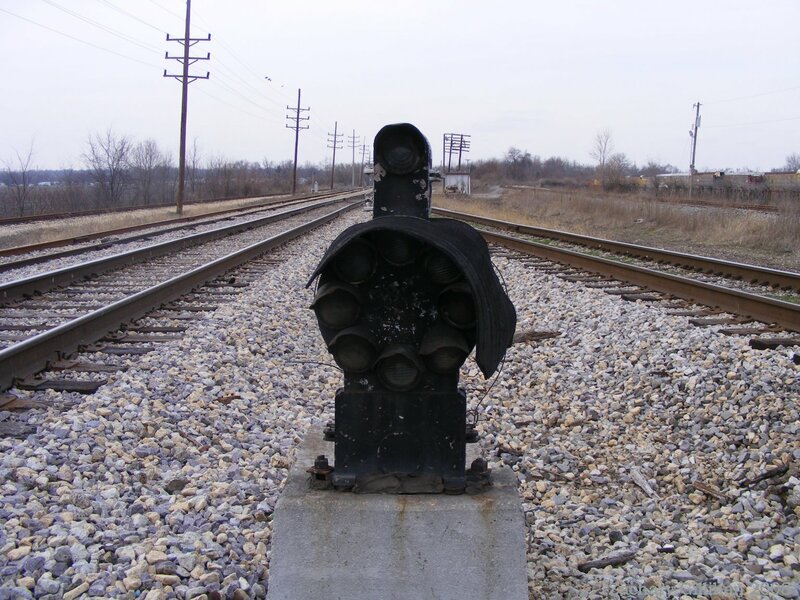 The steel signal cases where installed in 1940 with the GRS Electric Interlocking. 2008, Standing on the Old C&A railroad to the close left is a white post, this is where the Signal 9R once was and was stolen, UPRR had yet to replace that signal but since as. Further down the line you can see Signal 7LA on the bridge and Signal 9L to the left of that.